The 9 x 6 Iris Axi Playhouse certainly does have a kooky and fun style that makes it stand out from the rest. As well as being a whole lot of fun to look at, the playhouse is also a very good size. Inside they will not only have a lot of room to dance, play and spend time with their friends, they will also have a lot of headroom so they can jump around as well. Outside the playhouse is just as much fun as the inside. There is a lovely little decking area, complete with a crooked railing for safety. Then there is a small ladder that is made with solid and large rungs for them to climb. Right outside the door we have this fun slide so they can finish playing inside and then go right down the slide. 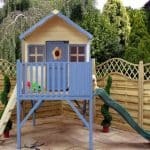 This is one of the more robust playhouses on the market right now thanks to being made with strong, Asian cedar timber. This timber is used from top to bottom and is what makes the 15 mm thick, tongue and groove shiplap cladding and the frame so strong and impressive. 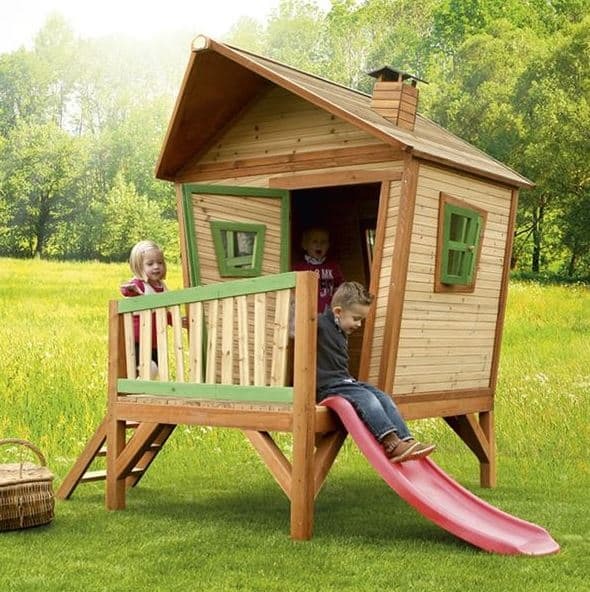 The walls and frame along with that wooden apex roof and the floor make this one very well designed and long lasting playhouse. The 9 x 6 Iris Axi Playhouse really does stand out from all the rest with its funky, unique and crooked design. 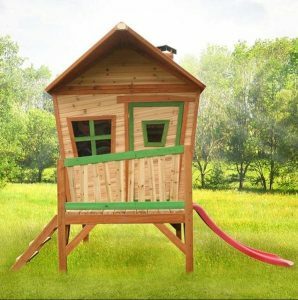 At, 9 foot 1 inch wide and 5 feet 10 inches deep this is actually a bit bigger than the other crooked style playhouses from Axi. We do like when playhouses go for a log cabin or a proper house type of look, but this one here is all about being something that kids are going to think is cool and cool it certainly is. One thing we must mention is that at, 7 feet 3 inches high while it is not too far off the ground it does have a fair bit of headroom inside the playhouse. The first feature that we want to talk about is the slide – what kid doesn’t love to go down a slide and also throw their teddies down? This is sure to get used over and over again and on the other side of the playhouse there is this really nice ladder that is made to be kid safe. The ladder is only 3 rungs high and has these large rungs so that even smaller kids will be able to climb up. The decking area is actually rather spacious and the railing to keep them from falling or should we say jumping off is done in the crooked style as well. The apex roof on this playhouse is very unique, Axi have a couple of these crooked style playhouse, but only this one has a roof that sticks out at a point on the front. This not only looks really good, but it also gives the decking a little protection from the rain. The roof is made with wood which really is something we like and on the top they have this fun pretend chimney. The smooth look of the walls is down to the impressive Asian cedar timber that is used. This is already strong, but Axi have made sure it is extra strong by making it 15 mm thick. One thing about the cladding that we absolutely love is how on the front they have made it at an angle to go with the weird and wonderful look of the rest of the playhouse. 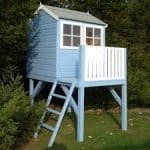 This is one of the more sturdy playhouses we have seen and that is great news if you have kids who love to dance, jump around or just play a little rough. The frame is planed and smoothed and at 38 mm thick is going to keep the playhouse solid for many years. Kids can go crazy as we all know, if they are not jumping around pretending to be Tigger or hitting the ground like the Hulk they are doing some other kind of fun activity that sees them going wild. Well Axi clearly had this type of play in mind as the floor both inside and on the decking is very strong. The playhouse will have a very basic form of treatment applied to the timber, but this is only to protect the timber during delivery and installation. Shortly after installation, treatment is required again so make sure you have a tub of treatment ready before the playhouse arrives. The wood will keep that smooth look as long as you remember to treat it, not all the time, once a year will do. The Axi playhouses give you a five year guarantee and we feel that this is generous enough and most likely you will not have to use it. The door on this playhouse is really fun in that it has a crooked look to it like something out of a kids TV show. The door is a very decent size and it even has a little window on it as well. One really fun aspect of this playhouse is that the door is one the same side as the play house so the kids can runs straight out of the playhouse, down the slide and then in the house for tea. The 9 x 6 Iris Axi Playhouse has a good amount of windows that are all made with anti shatter acrylic. This material is used instead of glass to keep things safe. 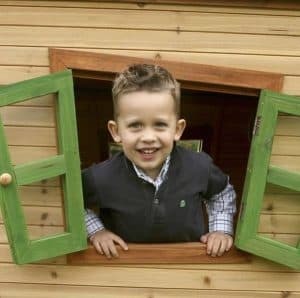 The front of the playhouse has a large fixed window which goes well with the one of the door. The sides have their own windows as well, but these can be opened and then securely closed with magnets. All of the windows have a twisted, weird and generally awesome look like the rest of the playhouse. Security to be honest is not really something that we put high on our list of what makes a great playhouse. Still with that being said this playhouse when the windows are closed and the door is also, is very secure. Privacy is not normally something that you get with a playhouse, but this one thanks to the way the windows are placed and also their design does offer a little bit more privacy than we would have expected. Axi are not offering any customisation options with this playhouse, but the style of it is so fun and unique anyway that we are not sure we would want to mess with the design at all. Still a bright coloured wood treatment would make this stand out even more and if you are feeling brave, you could even get the kids to help paint the playhouse. 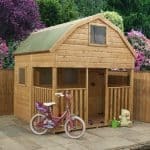 There are a few different extras with this playhouse such as the solar kit, which for £74.95 will let you put a little solar panel on the playhouse so they can have power – kids really do not know how good they have it these days! There is also an anchor kit which is designed to stop the playhouse blowing into next doors garden if the wind is bad. 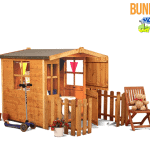 This is fairly priced at £54.95, but really this playhouse is heavy enough that we do not think it is necessary. A chalkboard to go inside the playhouse and fun name tag that will go outside can be added. These cost £29.95 each. The last extra is plant and flower box which you can use to brighten up the decking or even place under a window for a fair price of £34.95. Using Asian cedar timber was a very smart move that gives the playhouse a very high quality look and feel. Not only does this have a truly great look, the materials used will also last a very long time. They are made to take a little bit of abuse from the kids and with a fresh coat of treatment once a year they will also stay rot free. We feel that the pictures really do not do this justice in regards to how big it is. The actual playhouse may not be the largest we have seen, but it is still a good size and you also have the decking area outside to play with. Get a friend who is willing to help and who is also not too shy about taking care of the coffee and you will have no trouble at all. Instructions are included and you are looking at about 4-6 hours to get this built. 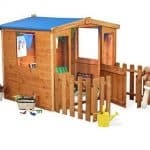 At £724.95 this is not what we would call a cheap playhouse, but for the money it is very well made, long lasting and of course it is going to give the kids many years of enjoyment. Final Thoughts: We think that the, 9 x 6 Iris Axi Playhouse has a very clever and fun design. With its crooked and slanted look it is going to be something that really does make the kids smile. The ladders and the slide are very fun and due to their size we feel that they would be perfect for younger children as they will be able to use them easily without the help of a grownup. 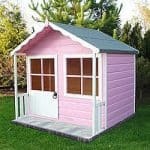 In all this really is a fantastic playhouse and while the price may not be cheap, you can be sure that this playhouse will last as long as the kids can fit inside. 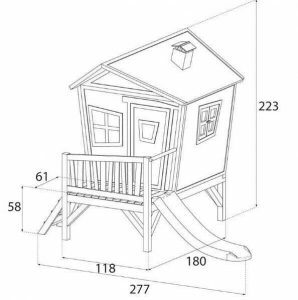 if you want a playhouse that is just as much fun to look at as it is to play with then this is one that needs to be high on your shortlist.